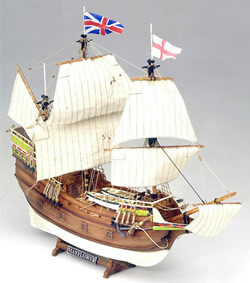 Billings Boats BIL820 Mayflower Pilgrim Ship 1/60 scale wood ship kit! A three-masted galleon launched in 1615. Length 19.50 m, breadth 7.95 m, draught 3.35 m and a displacement of 180 tons. The first information about the Mayflower dates from 6th September 1620. After a number of difficulties, the vessel sailed from Plymouth in England with 102 men, women and children on board. After 67 days at sea, the Mayflower cast anchor at the port later to be called Provincetown – almost 200 miles further north than planned. Mayflower II was built in l957 in Brixham, Devon and sailed to the USA, where it is now permanently anchored as a gift to the American nation.